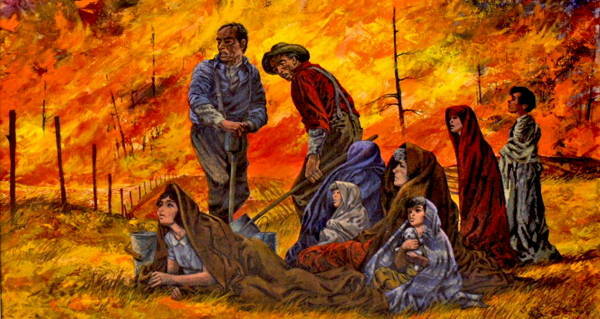 Although the Peshtigo Fire was the deadliest in American history, there's one astounding reason why few remember it today. Wikimedia CommonsMemorial marking the cemetery of Peshtigo Fire victims, including 350 unidentified bodies. Peshtigo, Wis.
On the night of Oct. 8, 1871, the mouth of hell did indeed seem to open up in both Chicago and Peshtigo, Wis.
As lore has it, at 9 p.m. on Sunday, Oct. 8, Mrs. O’Leary was milking her cow in her Chicago family barn when the cow kicked over a lantern, igniting the surrounding hay. While the Chicago Fire Department quickly responded to the alarm, the watchman made a mistake and led the firefighters to the wrong location, wasting valuable time. The fire then began to spread and made its way across drought-ridden Chicago, scorching 3.3 square miles of the city. The occurrence of the meteorological phenomenon known as a fire whirl — when hot air rises and interacts with cold air creating a tornado-like vortex — contributed to the fast-paced spread of the conflagration as it sent flaming debris flying from one place to another. Finally, on Oct. 10, two days later, the fire finally burned out, ultimately leaving 100,000 of the city’s 300,000 people homeless, and killing 120 to 300 others. But on that very same night, some 250 miles north of Chicago, another inferno raged as well, this one in Peshtigo, Wis. 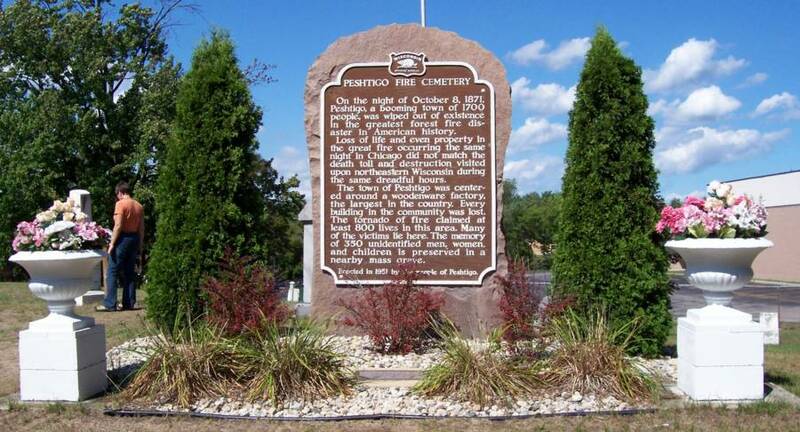 Although widely eclipsed in history by the Great Chicago Fire, the Peshtigo Fire proved even deadlier than its neighbor to the south, and in fact gained the infamous status of the deadliest fire in recorded history. The Peshtigo Fire began in the forest, where it was common practice among midwesterners to start small fires in order to clear trees for farming and railroads. However, on Oct. 8, strong winds moving in from the west fueled the flames and caused them to spread to the town of Peshtigo, turning the innocuous fires into a raging and deadly firestorm. The Peshtigo Fire ultimately reached the blistering temperature of 2,000 degrees Fahrenheit, and speedily fanned through the fire hazard of a town built out of wood. When the flames eventually died out, the damage of the Peshtigo Fire was staggering: The conflagration had consumed 1,875 square miles, obliterated 12 communities, and caused the deaths of between 1,500 and 2,500 people. Because so many people died, there were not enough survivors to identify the victims, and many bodies remain unidentified to this day. 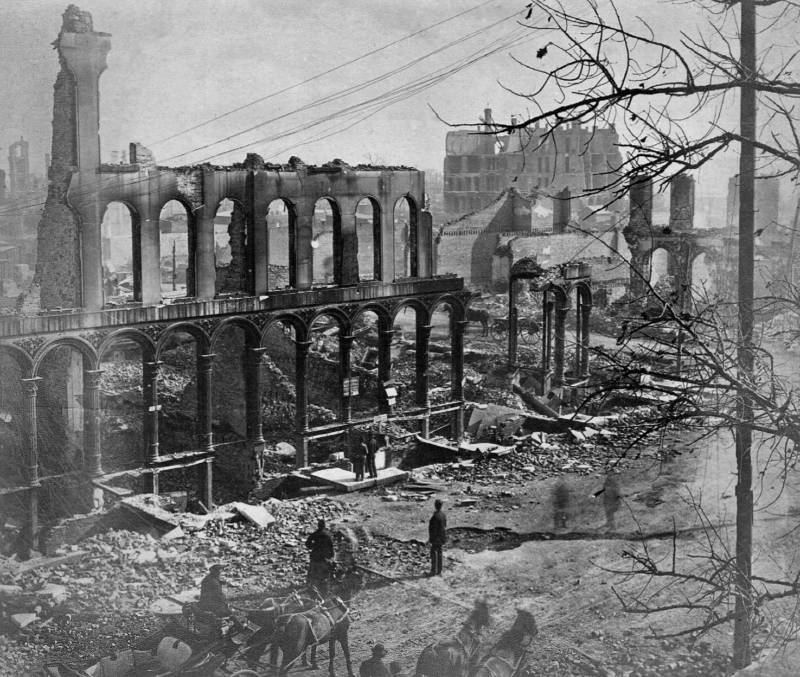 Wikimedia CommonsDestroyed buildings ravaged by the Great Chicago Fire. On the very same day, beyond Chicago and Peshtigo, fires also raged in Holland and Manistee, Wis., across Lake Michigan from Peshtigo, and farther south in Port Huron, Mich. Because of the coincidence and relatively close distance between these locations, some have theorized that the origin of all these separate fires was one and the same. One of the most popular of these theories even turns to an extraterrestrial cause: a comet. According to this theory, the impact of fragments from Comet Biela struck Earth and sparked the fire. However, scientists have widely debunked this theory claiming that meteorites cannot ignite a fire as they are cold when they reach Earth’s surface. Thus, the complete origins of the Peshtigo Fire, and the Great Chicago Fire, remain a mystery to this very day. After this look at the Peshtigo Fire, read more about the Great Chicago Fire. Then, read up on Centralia, Pa., the town that’s been on fire for more than 50 years.